Joe Wallis made his first appearance on Cardboard Gods early on, thirty or so cards into the imposing task of writing about every card that ever came into my hands as a child (and some cards that have found their way to me since then). I often miss those early days of—what should I call it? The project? The compulsion? The flowering of mental illness? Anyway, I miss it, even as I realize that I’m prone to romanticizing anything as long as it belongs to the past. When I was just starting to write regularly about my baseball cards, the touch of childhood was still crackling on the surface of the cardboard. I’ve been reading J.D. Salinger stories the last few days, and many of them center on the threshold between childhood and adulthood. In Salinger’s fictional worlds, childhood holds life and liveliness and imagination and unaffected sincerity, while adulthood offers nothing but fakery and the keeping up of appearances and the cruelty embedded in social hierarchies. Many of the stories reveal Salinger’s stinging, sardonic masterpiece, The Catcher in the Rye, to be, by comparison, his most hopeful work. In Holden Caulfield, Salinger found a lasting, if compellingly tenuous, bridge between the worlds of childhood and adulthood. In the short stories, on the other hand, there are no lasting bridges, only harrowing gaps. The man (“see more glass”) in “A Perfect Day for Bananafish” can’t endure life on the adult side of that gap; Eloise in “Uncle Wiggily in Connecticut” seems ruined by the gap, too; the narrator in “The Laughing Man” survives, but his childhood on the yonder side of the gap does not. “For Esmé with Love and Squalor” offers a hint of a bittersweet bridge across the gap, in the form of the story itself, which is a loving stretch across the gap by a traumatized veteran to a young girl who stands alone among the uncorrupted entities of the world. Holden is more than the hint of a bittersweet bridge, of course. He’s a living and breathing bad-postured avatar that millions have poured themselves into as if into a second skin, and it’s because he bridges that universally felt gap between childhood and adulthood in a way that feels truer to that element of the human experience than any artistic creation ever has. When I opened up the box of baseball cards from my childhood and started writing about them, I was trying to follow Holden’s footsteps and bridge that gap, and in those first few weeks, there was an immediate charge in the cards as I held them. But everything gets old, especially rituals, so sometimes, especially if I’m in a writing slump, I get nostalgic about the days when I could pick up a Joe Wallis card and imagine a baseball player who (somewhat like J.D. Salinger, now that I think about it) could not abide in the civilized world and so took to the woods to be wild and malodorous and hairy and free. But anyway, here I am again, and here I’ll be. In religion, there’s the thrilling moment of epiphany or conversion or enlightenment or whatever, I guess. You “see the light.” After that: well, you try to be sincere with your prayers. You try to find ways to connect to the mystery. The first mystery of this Joe Wallis card is his batting stance. On first glance, I thought this card might be a strange mistake, for the Joe Wallis card I am more familiar with shows him in a right-handed batting stance, while this card shows him bemusedly following through on a left-handed swing. When I looked at the back of this card, I thought that a piece of information included there—“Bats: Left”—proved that the card here was correct and that the later and hairier Joe Wallis card from 1980 was a mistake. But on baseball-reference.com Joe Wallis is listed as being a switch-hitter. I’m not sure why he is listed on the back of this card as only hitting left-handed, but it may have something to do with his career .199 batting average against left-handed pitchers (compared to his .263 average versus right-handers). Maybe before this card came out the Topps people called him to confirm his status as a switch-hitter, and at that point he was considering forgetting about being a switch-hitter and just sticking to being a lefty. In that light, it’s interesting that his later card with the A’s, the one I am more familiar with and that is his last card, shows him from his weaker side. He was determined, I guess, to prove that a debilitating dooming weakness could be turned into a strength. The second mystery was pointed out some time ago on the original Joe Wallis post by a commenter who goes by the name Champ Summers. Champ linked to an article that describes a minor league baseball game in which Joe Wallis hit a fly ball that never came down. How do you survive a mysterious and beautiful event such as that? How do you not slowly unravel and grow increasingly less able to exist in the mystery-stripped world of adulthood? How do you not take to the hills? A ball went up and never came down. People will tell you that only a child would think that such a thing was possible, but you were there. You hit the ball that never came down. Don’t let anyone ever tell you differently. Joe Wallis had a great nickname. He was “Tarzan” Joe Wallis. I think the bear on the shoulder of Joe Wallis’s uniform basically looks like Joe Wallis himself. 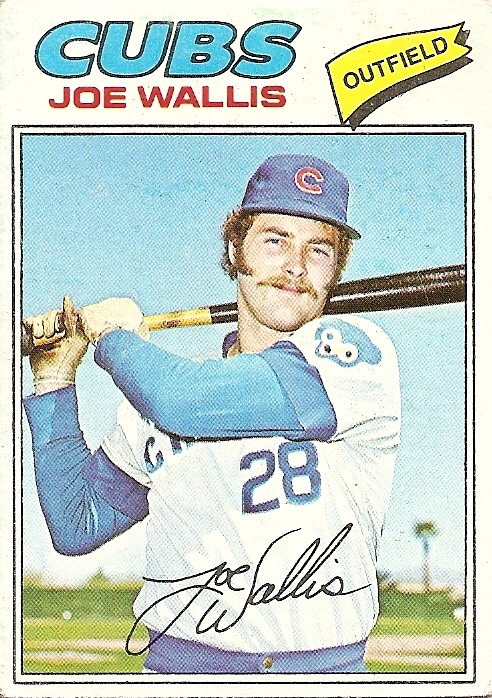 As a Cubs fan I remember Joe Wallis as being heavily hyped when he was coming up through the system; he was supposed to be the consumate 1970’s centerfielder (good defense, speed on the basepaths). Looking at the rather doughy & pudgy guy in this picture, it’s no wonder the 70’s Cubs sucked. If your scouting department expects THIS guy to lead off & steal 50 bases, well, of course you trade Rick Monday for Geoff Zahn. I’ve often felt that many of my high school/college friends financial success rest more with the abilities of “fakery” and “keeping up with appearances” than any kind of intelligence or work ethic. Because Salinger was such a recluse, part of me thought he had been dead for twenty five years. I often though about his experience in WW2 and the effect it had on his writing and his world view in general. Whenever I see pictures of these mid-late 70’s Cubs it just reminds me that they cost Rick Reuschel, a Cy Young Award, Much Better Recognition, and a shot at the HOF. How the heck did Joe Wallis get 983 plate appearances in his career?? In a truncated 5 year career he was a poor fielding outfielder who had a career ops+(88). He had a WAR of -0.7, so he was below replacement level for his career. And who the hell ever thought that this guy could be a big league center fielder? I was just reading about the surprisingly strong case for rating Reuschel much more highly in the history of the game. I’ve been wanting to do a post about him almost since the start of this operation. thanks for mentioning the no-hit bid. i was hoping you’d overlook that. with a baseball card in my hand, i am the most powerful person in the world. with a card in my hand, i can do something the president of the united states can’t do, the most intelligent genius on the planet can’t do, the best athlete in the universe can’t do. i can travel through time. I think the way baseball has traditionally rated pitchers is by far the most nonsensical aspect of the sport. W-L record is basically meaningless. It’s some kind of odd vestige from the 19th century, probably taken from Boxing. For example, Steve Trachel won 15 games in 2006 and was horrible. Even ERA is flawed because of park factors and league scoring variations and fielding. Fenway Park and the Astrodome is looked upon as the same. Whether you have B. Robinson, Belanger, and Grich or Henderson, Tavares, and Flynn you’re judged the same way. Flip pitchers around to other teams and you get completely different results. Koosman is in the HOF if played for the Orioles, Dodgers, A’s, Pirates or Reds. Jim Palmer would have had a hard time getting in the HOF if spent his entire career with the Mets. Put Whitey Ford on the White Sox and he doesn’t get in the HOF. Put Billy Pierce on the Yankees and he gets in the HOF. Catfish Hunter never makes the HOF unless he’s on those early 70’s A’s teams. I could go on, but there’s no other position like it. Every other pitcher except Bert Blyleven who’s ranked 1-30 is in the HOF. Reuschel had the misfortune of playing on some lousy Cubs teams that had horrible fielders and on top of it he pitched in a hitter’s park. He should have won the 1977 Cy Young. On top of that he was fat so he never gave off the image of being a great athlete. To me, this problem of perception verse reality is one of the most frustrating aspects of Baseball. Hey Josh, I just wanted to say that this entry crackled! It has been a while since I have read Cardboard Gods, but like any great writer, you sometimes wander away for a time only to re-discover the writers unique perspective. Maybe this sounds critical on my part, but I think it is the best compliment I can give you. This post also really made me want to go back through my Salinger collection and take that journey again. So in my mind the last few days to re-read are Salinger, Bukowski, and Wilker. It is that season for me. Joe Wallis ’79 Topps was my first baseball card, and I remember thinking to myself in my limited understanding of the world as a 9 year old, “How can a guy with so much facial hair be an athletic ballplayer?” Nowadays it’s great to see those “BEARD POWER” posters in Philly. I remember a WGN-TV preseason preview that included a gag piece in which a batter hit a towering fly ball. Joe was in shallow centerfield and got a great jump on the ball, running and running and running – to the warning track, out the utility door, across the sidewalk and down the street, where he finally made the catch. Obviously the team and the station were trying to create a myth about Joe’s defensive prowess. After Rick Monday, Joe was my favorite Cub of that era – he’s the only player for whom I deliberately collected every Topps card issued of him. Not that it was very difficult – he had a short career.